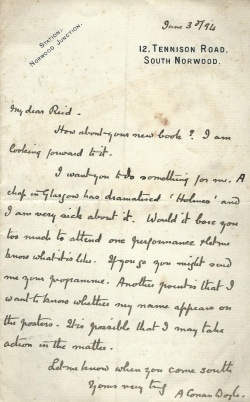 This letter was written by Arthur Conan Doyle on 3 june 1894 to John Reid. He confessed being sick about a new Holmes drama perforled in Glasgow. In December 1893, Sherlock Holmes: A Psychological Drama in Five Acts, a play by Charles Rogers, was performed at the Theatre Royal (Hanley, Stoke-on-Trent). The play began touring on 28 may 1894 at the Theatre Royal (Glasgow) with Holmes played by the actor John Webb. How about your new book? I am looking forward to it. I want you to do something for me. A chap in Glasgow has dramatised 'Holmes' and I am very sick about it. Would it bore you too much to attend one performance and let me know what it is like. If you go you might send me your programme. Another point is that I want to know whether my name appears on the posters. It is possible that I may take action on the matter. This page was last edited on 3 January 2019, at 15:59.